We’re 12 weeks into the college football season and no one can quite make sense of the SEC West. How did Mississippi State jump from unranked to No. 1? Why has Alabama looked like a juggernaut some weeks and vulnerable others? Why has LSU looked like a completely different team recently than the one Mississippi State pushed around in late September? When the No. 1 Bulldogs visit the No. 4 Crimson Tide on Saturday, the only thing bigger than the stakes is the surprise that this game -- often an afterthought for the Tide -- looms as the biggest in college football this season. The rise of Mississippi State, the inconsistency of Alabama and parity in the SEC can best be explained by, well, college basketball. How? Think of Mississippi State like Wichita State, Butler or George Mason. The Bulldogs are a cohesive program with a strong system and savvy veterans that’s thrived thanks to continuity, player development and strong coaching. Losing no players early to the NFL Draft the last two years has fortified and stabilized the program. Consider Alabama -- and LSU for that matter -- as a football version of Kentucky basketball. Those programs are constantly scrambling to replace high-end talent. Along the way, they’ve occasionally relied on unreliable players. The Crimson Tide have lost eight players to early entry the past two seasons, and LSU lost a jaw-dropping 18 non-seniors to early entry over the past two years. “The truth of it is in a parallel universe, Alabama and LSU have become the Kentucky of college football,” said Phil Savage, the former Cleveland Browns general manager who does color commentary for Alabama broadcasts. • STAPLES: Could Playoff Committee exhibit a style bias? In the macro, it’s easy to see why there’s more parity in the SEC and college football overall. According to statistics provided by the NFL, there were 102 players who declared early for the 2014 NFL Draft, including 28 from the SEC. That’s more than double the 46 players from FBS schools who declared early in 2009. It’s even a sharp spike from the 73 players in 2013. (It’s just as eyebrow-raising that 37 early entrants went undrafted in 2014). What the exodus has done is allow non-traditional programs with strong systems -- Mississippi State, Arizona State, TCU, Kansas State and Ole Miss -- to be in national title contention alongside the usual collection of blue bloods. Savage runs the Senior Bowl and the most telling statistic about the drop in veteran talent in the SEC this year comes from his invitation list. In each of the last two years, Savage issued more than 30 invitations to SEC players. This year, that number has dipped to 20 (juniors are not eligible). Given the recent turnover, just how good is Alabama? The Tide are 8-1 but have struggled in road games at Ole Miss (their only loss), Arkansas and should have lost to LSU last week. There’s clearly talent there, as Mississippi State beat writer Bob Carskadon dug up this gem of a statistic: The Bulldogs have three players in their starting 22 who were four- or five-star recruits coming out of high school. Alabama’s starting 22 has only two starters who weren’t a four- or five-star prospect. What’s the difference? One veteran SEC assistant who has faced both teams points to a simple factor that may determine the outcome on Saturday: “Where’s the game being played?” he asked. 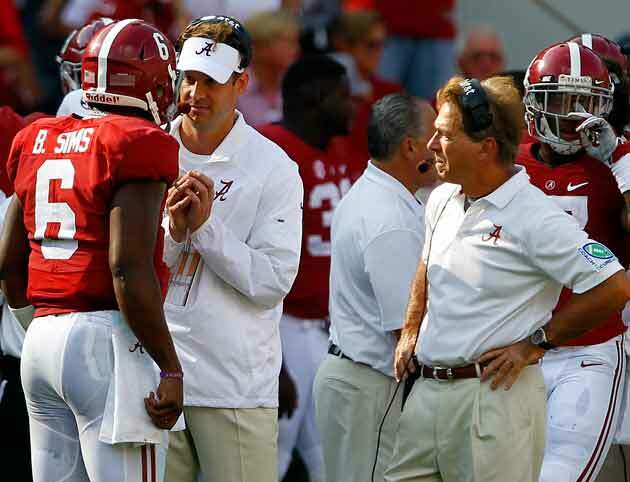 The coach pointed to Alabama offensive coordinator Lane Kiffin being able to walk senior quarterback Blake Sims, a first-year starter, through the play calls. He said that in Tuscaloosa, where the game is being played, Kiffin can communicate better with Sims. The coach said at times Kiffin will see how the opposition is covering star receiver Amari Cooper and adjust his play call. That’s harder to do on the road. Savage agreed and said Alabama’s had problems with the play clock winding down and getting a clean play off at the line of scrimmage on the road this year. “At home they just play better,” the SEC assistant said. Alabama’s talent dropoff is relative. The best matchup on Saturday will be between Mississippi State’s stout front seven -- highlighted by lineman Preston Smith and linebacker Benardrick McKinney -- and Alabama’s inexperienced offensive line. Savage said the Tide’s best offensive lineman is true freshman left tackle Cam Robinson. He sees Robinson, a blue chip recruit from Louisiana who has struggled with an ankle injury, as having the tools of a future first-round draft pick. But he’s also inexperienced and has gone through growing pains this season. Those are the types of first-world problems that come with recruiting five-star athletes that thrive and leave early for the NFL Draft. As Alabama has replenished, Mississippi State has developed and flourished. Has the Tide’s talent matured enough to match up with the Bulldogs’ cohesion? The beauty of this season is that it’s mid-November and we really have no idea. As the final seconds ticked off the clock of Ohio State’s 49-37 thumping of Michigan State on Saturday night, Buckeyes coach Urban Meyer got a bear hug from tight end Jeff Heuerman, joined his wife, Shelley, to sing “Carmen Ohio”, and was as happy as he had been in years. “That’s one of the best wins I’ve ever been a part of,” Meyer told The Inside Read on Sunday. Along with avenging last year’s loss in the Big Ten title game and re-establishing the Buckeyes atop the conference pecking order, Meyer had another reason to celebrate. The Buckeyes not only nudged their way to the fringes of the College Football Playoff conversation, they also declared themselves a preseason Top 5 team and playoff frontrunner for next season. With the return of star quarterback Braxton Miller from a shoulder injury, a depth chart that will lose only eight starters and an offense humming like Florida in the late 2000s, these Buckeyes showed that they’re poised for a long run. Ohio State loses only four key contributors on offense and defense. At a majority of those positions, there’s confidence in the replacements. The big losses on offense will be at wide receiver, where Devin Smith and Evan Spencer have been solid. Smith’s ability to stretch the field will be difficult for Ohio State to replace, but the Buckeyes have recruited well there. The loss of Heuerman at tight end will hurt, but Meyer will replace NFL talent with NFL talent. The Buckeyes are high on junior Nick Vannett and redshirt freshman Marcus Baugh. The Buckeyes lose only Darryl Baldwin on the offensive line, and the senior right tackle is in his first year as a starter and isn’t considered an NFL prospect. With the job co-offensive coordinator Ed Warriner has done transforming this group from a September liability to a November strength, there’s little doubt Ohio State will have one of the league’s better lines next year. “He develops offensive linemen as well as anyone,” Meyer said. On defense, four senior starters will also depart -- star tackle Michael Bennett, defensive end Steve Miller, linebacker Curtis Grant and defensive back Doran Grant. The biggest loss will be Bennett, a monster defensive tackle. At end, the Buckeyes could be in-line for an upgrade if Noah Spence returns from his drug suspension to his starting spot (the suspension is under appeal). Top 2014 linebacker recruit Raekwon McMillan, who is playing plenty of snaps already, should seamlessly replace Curtis Grant, and there’s buzz in the program about freshman Marshon Lattimore’s ability at defensive back (he’s redshirting this year). 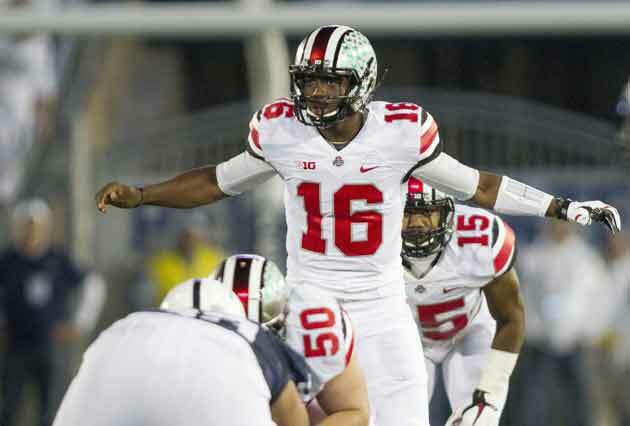 The Buckeyes have re-emerged in the national title talk because of the depth of their program. That depth of talent should only continue to increase, which means more moments like last Saturday on the horizon for Ohio State. Derrick Henry was flipping Bigfoot, going against the Amazon River and climbing Mount Everest. The Alabama sophomore running back may have felt that way for good reason during rigorous extra personal workouts last summer. After all, he was overturning monster truck tires, swimming in a pool against a strong current and doing footwork drills while wearing an elevation training mask. He did it in preparation for games like Saturday’s against top-ranked and undefeated Mississippi State. He might have a heavier workload in the SEC West clash with Crimson Tide running back T.J. Yeldon once again nursing an injury, this time a mild left ankle sprain. Entering this season, there were Heisman Trophy expectations for the 6-foot-3, 241-pound Henry who has rushed for 554 yards and four touchdowns on 111 carries this season, second-best on the team behind Yeldon. The hype was spawned by Henry’s dazzling 161 all-purpose yards and two touchdowns in Alabama’s loss to Oklahoma in the Sugar Bowl last season. Never mind that until then he had accomplished little (he otherwise had just 282 rushing yards last season) and is in the same backfield as Yeldon, the only Crimson Tide running back to rush for at least 1,000 yards in his first two seasons. But Henry and Yeldon, who is averaging nearly a yard less per carry, have underwhelmed this season. It’s caused the hoopla surrounding Henry to subside, but he’s once again shown flashes of his spellbinding promise. He had 113 rushing yards and a touchdown on 17 carries in a season-opening win over West Virginia. He also had 111 rushing yards and a touchdown on 20 carries in a blowout of Florida. The latter was the last time Henry had a 100-yard rushing game, but that was nearly two months ago. Just hearing Henry recite his personal workout regiment is tiring. But he’s taken the same tireless approach to his workouts dating back to his days at Yulee (Fla.) High, where he broke Ken Hall’s 51-year-old national high school record for career rushing yards with 12,124 yards. It’s where he also flipped the oversized tires, sometimes filled with water from overnight rains, in sets of 10 this summer. He did so in the sweltering sun with his increased endurance that he honed doing lateral quickness drills wearing an elevation training mask, which limits oxygen intake. Yet it was the pool workouts he did when he returned to Tuscaloosa that challenged him the most. They included swimming against a strong current while wearing fins and jumping from side-to-side. “That right there was so hard,” Henry said. Saturday figures to be as well against a Mississippi State defense that is the FBS’ best in the red zone. It’s another challenge Henry is surely up for. With last Friday’s win at Temple in the final seconds, Memphis (6-3) became bowl eligible for the first time since 2008. The Tigers have come so far that they’ll be favored to win their final three games -- at Tulane and against South Florida and Connecticut at home. Things have changed so much under Fuente, 38, that the players couldn’t even get through one-third of that first workout, which Fuente learned under TCU’s Gary Patterson. It’s a circuit training exercise that consists of six stations focused on change of direction and lateral movement. At Fuente’s first team meeting, there were just 51 scholarship players. That included several who ended up leaving because, as Fuente says, they “didn’t want to be part of a real FBS program.” Fuente credits director of player personnel Adam Lechtenberg, who is in charge of the team’s walk-on program, for helping restore the program’s numbers. Many walk-ons are significant contributors, including running back Brandon Hayes who leads the team in rushing with 606 yards and five touchdowns. “If you want to work hard and have a good attitude, you’re going to get a chance,” said Fuente, who has a 12-20 record in his three seasons at Memphis. During the first day of offseason workouts this year, Fuente’s players not only completed all six stations of the circuit training exercise, they also reminded the coach of his TCU days. Afterward, he told his team it had “a chance to be special” this season. Fuente’s own cell phone could be ringing soon, from someone trying to lure him away from Memphis to a new job. • Kansas interim coach Clint Bowen has tried to do all he can to change the program’s bleak culture. Since he took over after Charlie Weis’ disastrous three-year tenure ended four games into this season, there have been Whiffle ball games in the locker room, dance contests on the field and a team movie the night before games, along with cards and dominos. Bowen even schedules an extra 15 minutes at non-gameday team meals so his players have to talk with each other. But for all the loosening up, there was one thing he refused to change: his ultra-serious pregame approach. “I’m looking around and I’m like, ‘Man, I created one serious tense environment here,’ ” Bowen told The Inside Read. In Bowen’s four previous games as interim coach, he allowed his players to laugh and be loose during their pregame walk around the hotel and breakfast. But he insisted the mood get more serious during their walkthrough. And by the time they had their pregame meal, he wanted them to be so focused they didn’t say a word. He plans to keep the pregame music. Kansas fans tore down the goal posts afterward. It was for good reason because Bowen’s victory gave him the same amount of Big 12 wins -- one -- as his predecessors, Weis and Turner Gill each had in a combined 34 conference games. Now that would be a real change. • With former Texas A&M starting quarterback Kenny Hill’s two-game suspension over, keep an eye on whether he can ditch the Johnny Manziel hangover. It took Hill just one start to break Manziel’s single-game school passing record with 511 yards, but he’s been like Manziel off the field for too long. Hill often hung out socially with Manziel, so it wasn’t much of a surprise when Hill was found asleep outside a College Station restaurant in March and arrested for public intoxication. Like Manziel’s family, Hill is also from prominence and his father, Ken, had a 14-year career in Major League Baseball. The younger Hill has long been viewed as entitled, a “spoiled brat,” according to one recruiter, dating back to his high school days at Dallas-area powerhouse Carroll High. But while Hill had his struggles in three straight losses earlier this season, he is by all accounts a hard worker. His problem hasn’t been football-related, it’s when he’s away from it. He needs to grow up off the field before his Johnny Football experience completely ruins him. And with Kyle Allen, who threw for 277 yards and four touchdowns in Saturday’s 41-38 upset at Auburn, and highly touted recruit Kyler Murray on the way, Hill better do so quickly. The coach was referring to last season’s crazy stretch in which Chris Davis’ infamously returned an Alabama missed field goal 109 yards for a touchdown on the game’s final play, and the deflected Hail Mary to beat Georgia the game before. • Like Alabama’s Derrick Henry, South Carolina running back Mike Davis entered the season with high expectations. The 5-9, 223-pound junior was viewed as a potential Heisman Trophy contender for a Gamecocks team picked to win the SEC East after rushing for 1,183 yards and 11 touchdowns last season. Even former Gamecocks running back George Rodgers, the 1980 Heisman Trophy winner, touted Davis for the award. Instead, he struggled with a pulled hamstring and bruised ribs leading up to South Carolina’s disastrous season-opening blowout loss to Texas A&M, a game in which he had a season-low 15 yards on six carries. He’s gone on to rush for more 819 yards and eight touchdowns on 158 carries this season, but he’s been considered a disappointment for a Gamecocks team with an even more disappointing 4-5 record this season. But NFL scouts are still intrigued by Davis, who is expected to leave for the NFL Draft after this season. One scout projects him as a third- to fourth-round pick and compared Davis’ lackluster year to the one former Arkansas running back Knile Davis had in 2012. Kansas City ended up taking Davis in the third round of the 2013 NFL draft and he’s played well when Chiefs starting running back Jammal Charles has missed games due to injury. • Until Arizona State’s 55-31 romp of Notre Dame last Saturday, the last time many saw the Sun Devils was when they were throttled in late September by UCLA. That beatdown was ASU’s lone loss, but it had been a lasting one in terms of national perception. The victory has Arizona State (8-1) seemingly in control of its own destiny to make the inaugural College Football Playoff. All the Sun Devils have to do is win their three remaining regular season games (at Oregon State, vs. Washington State and at Arizona) and under that scenario beat likely Oregon in the Pac-12 championship game. Norvell said that Arizona State has still yet to accomplish any of its goals, but he and Sun Devils coach Todd Graham aren’t afraid to say what most coaches often avoid this time of year. “We want to win the national championship,” Norvell said. ASU’s chances will hinge on a youthful defense that’s been much better the last month, allowing an average of just less than 17 points per game compared to nearly double that previously (31.4). But the biggest factor will likely be redshirt senior quarterback Taylor Kelly, who is rounding back into his early-season form when the Sun Devils were a scoring machine. That was before he missed three games, including the UCLA loss, after undergoing surgery on his broken left foot that required him to wear a walking boot for six weeks. His 224 passing yards with three touchdowns on Saturday was his best performance since his return late last month. • Kentucky defensive end Bud Dupree has NFL scouts shaking their heads. But it’s not because of the 6-4, 264-pound senior’s team-highs of 5.5 sacks and 8.5 tackles for loss this season. The scouts are more intrigued by his potential that many believe is hardly being utilized in the Wildcats’ defensive scheme. • ELLIS: Bowl Projections: Who's headed to the playoff, all bowls? Ray leads the SEC in sacks (12) and could be a top 10 pick in the NFL Draft if he leaves after this season as expected. Dupree is an ideal outside linebacker for teams that run a 3-4 defense and should also be selected in the first round according to the scout. He could go in the high teens if he performs well at the NFL combine. The scout likes him more than former Georgia and current Pittsburgh Steelers linebacker Jarvis Jones, the 17th pick of the 2013 NFL Draft, and former Louisville and current Philadelphia Eagles linebacker Marcus Smith, the 26th pick of last year’s. 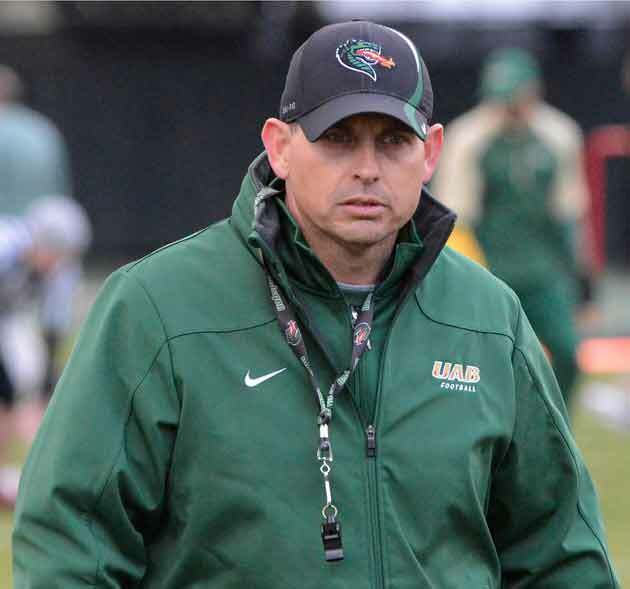 Bill Clark thought he knew what he was getting himself into when he became Alabama-Birmingham’s coach in January. It’s a job so difficult that his predecessor Garrick McGee quit on his own accord after two seasons to flee to Louisville as offensive coordinator. Yet Clark has miraculously guided the Blazers from one of college football’s worst teams to the cusp of bowl eligibility with a 5-5 record this season. But what Clark inherited might be in worse shape than he knew with university officials potentially looking at shutting down his program. That’s at least according to a group of boosters who recently brought up the matter in a letter to university president Ray Watts. The Inside Read caught up with Clark to discuss his program’s future, his high school coaching acumen and why Alabama coach Nick Saban was his favorite recruiter. There’s been speculation your program could be shuttered as part of an ongoing, year‑long study of the athletic department. What do you make of that talk? I had guys coming to me just wanting to ask about me getting a contract extension, where we were headed. A lot of this was former players. I guess they didn’t get any answers and I couldn’t really tell them anything. I think that’s how this all got started. We love what we’re doing and we really feel like we are making a huge difference here and I think this is where this all stems from. Hopefully, we’ll get some answers real soon. What have university officials told you? We all knew we were doing this study. Obviously, I thought this study was going to help us grow our facilities and really take it in the direction that I want to go in. So, I don’t really know much more than that. I think that’s kind of what’s scared our former players and guys that really care about what we’re doing. I think it scared them because I didn’t get more definitive answers. So right now, I couldn’t say. I think we’re all wanting to know definitively where we’re headed. I think everybody knows our facilities are just not what they anywhere should be and that’s one of those big things I’ve been working on. Many may not realize this, but football at UAB has been in existence for 24 years. In that time there has only been one bowl appearance. There’s an abundance of talent in the area. So what has to change? One of the biggest things we said in every facet that you can be seen from, we want to be good at it. We want to be excellent. The reason I say that, I was a high school coach for years so I know what it should look like and I know the energy. From feeling like you can come around as a coach and player to having camps to our uniforms, to Twitter, to, of course, how we play on the field. Is it an exciting brand of football? Is it somebody I would love to play for? Are they passionate? How do we train? Are we constantly having NFL folks come in and watch our guys? We want to be very open to them. From A to Z, we want it to be a place people would love to be and a staff that they would want to play for. Fun, energetic. I hope that’s what they’ve seen from us since we’ve been here. You graduated from Jacksonville State, your previous head-coaching job, but you didn't play football there. Yeah, I had a back injury coming out of high school. It was one of those things I thought I could play through, but just couldn’t. Ended up years later having a back surgery, but at the time, it was play or walk and I knew I wanted to coach. So I went ahead and started coaching high school early. But it worked out good for me because of the fact that I got to start coaching four years during that time of college. I got to coach with my dad, which was a great thing and really just helped my experience. You’re a former high school football coach who won a pair of state titles at Prattville (Ala.) High. Baylor’s Art Briles, Mississippi’s Hugh Freeze, and Auburn’s Gus Malzahn also won multiple state championships. It’s almost become in vogue to be a college coach who has high school pedigree, right? I’ve said it all the time, I think the one thing for us, we have had to do more with less. You have had to take what you’ve been given. I think a lot of that is player development. We talk about how do we totally develop these guys. Every facet to us is nothing that we could overlook because we had what we had. Whoever those kids were walking your halls you had to take. I think it’s made us be better coaches. It’s nothing against guys that have been in college their whole life. But I think those of us who have had to fix sprinkler heads and toilets, and teach classes and all of that, makes you appreciative and you know how to work, that’s for sure. You’ve also got a background in officiating. Oh yeah. Back when I was coaching in college in the springtime I would umpire high school baseball games, just to make some extra money. Obviously we all have great respect for what officials do. But I really can say, I’ve called high school basketball. You get an appreciation for those guys of how hard it is. I know what’s expected of those guys. I say before a lot of games, I know it’s tough. I know y’all are scrutinized just like we are. That probably was good for me in the overall picture. You just want to see consistency. I think that’s what we all want to see. None of us are ever going to be totally happy. When you coached high school football, who was your favorite collegiate recruiter and why? Oh, wow. Shoot, that’s a good question. I still remember when Nick (Saban) came in the first time when he was at LSU and just what a good job he did talking to our players. Two things he talked about were academics and NFL. It was career path. It was career or NFL. That always stood out to me. He didn’t talk about playing time, all those things. He knew the guy was a competitor. I guess and thought he was going to play anyway, so he talked about his future path after college. I thought that was different. • Brent Venables spent last Saturday morning catching a bunch of stripers and some bass on Lake Hartwell. One of the stripers weighed about five pounds, but the energetic Clemson defensive coordinator threw all the fish back into the lake, which is adjacent to the university’s campus and one of the Southeast’s largest. That’s why he made sure to emphasize to The Inside Read that he was catching, not fishing, but nonetheless had plenty of fun doing it with one of his sons and friends. “I could get used to this,” Venables said. Clemson fans have gotten used to Venables’ suffocating defense this season after another stingy effort in Thursday’s 34-20 win at Wake Forest in which his unit surrendered only 119 yards, including just seven yards on the ground. Nationally, the Tigers are ranked second in total defense (252 yards per game), first in tackles for loss (10.1 per game) and second in sacks (3.89 per game). It’s a senior-laden unit highlighted by sack master defensive end Vic Beasley that has grown up in Venables’ 4-3 scheme since his arrival three years ago from Oklahoma, where he was also defensive coordinator. Just 43, Venables used to be mentioned more frequently for head coaching jobs, but has turned down such opportunities at smaller programs. He insists on working where there are the necessary resources, players and expectations to win national championships. One that allows Venables, an avid angler, to get on the water, which he calls “Relax 101.” He and his family live on a lake, where they have a dock complete with a boat and a fish feeder. • Scott Lakatos got a call in May from longtime Virginia Tech defensive coordinator Bud Foster. Just four months earlier, Lakatos had resigned as Georgia’s secondary coach after four seasons amidst turmoil in the Bulldogs defensive staff. Foster didn’t have a job for Lakatos, but asked if he would be interested in joining the Hokies as a volunteer coach. Lakatos quickly sold his house in Georgia and moved his family to Blacksburg, Va. “I don’t know how much help I’ve been,” Lakatos told The Inside Read with a laugh. That’s because Foster’s aggressive defense is having one of its worst seasons, despite its masterful performance in Virginia Tech’s upset of Ohio State in early September, the Buckeyes’ lone blemish. The Hokies rank 31st nationally in total defense (345.1 yards per game) after having one of the nation's top 20 defenses in nine of the past 10 years. Lakatos’ relationship with Foster dates back to the mid-1990s when Lakatos was an assistant at Maine. He and other Maine assistants visited Foster and the Black Bears ended up running the same defense as Foster. Lakatos also gave Virginia Tech secondary coach Torrian Gray his first coaching job at Maine in 2000. This season has also given the 49-year-old Lakatos time to study offenses and come up with how he would stop them. His children are also excited about the possibility of once again seeing snow after seeing plenty of it when he coached at Connecticut. With the coaching cycle soon to be heating up, he’s increasingly been on his cell phone about potential jobs. Now if only Lakatos and Foster could fix Virginia Tech this season. Nevada coach Brian Polian thought it was a lie. But J.P. Pinocchio’s last name really is the same as the infamous Disney movie and the namesake for his two restaurants in the area, Pinocchio’s Bar & Grill. “It couldn’t be real, right?” Polian said. Polian, whose team is bowl-eligible at 6-3 after going 4-8 last season, also has a famous last name. His father, Bill, is the legendary former NFL general manager of the Buffalo Bills and Indianapolis Colts. But like Pinocchio, he’s made a name for himself.